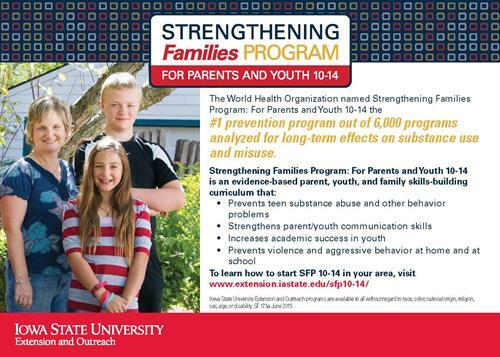 The Strengthening Families Program: For Parents and Children 10-14 is a FREE program for parents and youth ages 10-14 that helps build skills around communication, peer-pressure resistance, and goal setting. Families meet once per week for seven weeks to participate in a variety of family activities that focus on improving family interactions. Parents learned to set appropriate limits and follow through on consequences. The upcoming workshop series will begin on Tuesday, February 26 from 5:30-8:00pm at St. Stephen Lutheran Church in Urbandale. A meal and childcare will be provided. Tuesdays, February 26 to April 16 from 5:30 - 8:00 p.m.
Free Family Program includes a FREE meal and child care will be provided.